The only way to make Greek debt sustainable is to cut it by 30 percent and introduce a 20-year grace period, said PM Tsipras, as the landmark referendum on July 5 nears. Tsipras’ statement comes after the IMF said Thursday that Greece would need €10 billion over the next few months and an additional €50 billion in the next three years to pay the country’s arrears. Before making any repayments, Greece would need a 20-year grace period, making the last payment no earlier than 2055, the Fund said. This gives a clear view that the parties have grounds to resume negotiations on the Greek bailout cut short by the referendum. The report published Thursday was never shown to Greece in the five months of fruitless talks on the bailout, only after the negotiations had finally failed, said Tsipras. Tsipras has also asked fellow Greeks to vote against austerity one more time. “I urge you to say #OXI/NO to ultimatums, blackmail & fear. To say NO to being divided,” he posted on Twitter. 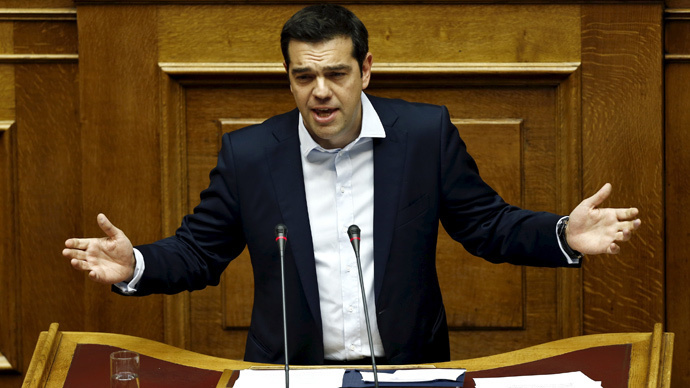 The question of leaving the eurozone will not be brought up on Sunday, according to Tsipras. The question is whether Greece is ready to continue the policy that is killing the country’s economy and cutting pensions, he added. On July 5 the Greek people will have to decide whether to accept or reject the proposals submitted by the European Commission, the European Central Bank and the International Monetary Fund at a meeting of the Eurogroup of 25 June 2015. On Wednesday, Greece defaulted on a €1.6 billion debt payment to the IMF that was due in June. Athens will have to make another major payment of €3.5 billion to the ECB on July, 20.